I'm from the North and I'm going to east well it's not easy to commute from north to east because it will take a long time to get in your destination for some heavy traffic and ride a different kind of transportation vehicle. Here in Philippines we have an issue when it terms of heavy traffic specially when your going to City like Manila, Pasay, and many more. Hindi ko kinaya yung traffic dito bess! We stuck from Sm Marikina for more than 1 hour then it's already 8:00 pm and I'm so hungry that time because I skip my lunch to finish my work earlier going villa east. Sabaw na sabaw na talaga ako beshiie yung feeling na mananapak na talaga ako! Then we suggest to going mall to take our dinner but Clang told us to wait outside because they pick up us from the Mall. Starving so much! From Concert buddies to true friendship buddies. I'm so happy to have them it's kind a worthy. The strong bond of friendship is not always a balance equation. Instead friendship is grounded in a feeling that you know the exactly who will there for you. When you need to something no matter what or when. True friendship is priceless. They listen your non sense questions. They give you a significant advises. They give you a reason to live in this world wonderful. They express kind of love. Yung tipong kahit anong layo mo pupuntahan mo yan beshiie ganern! 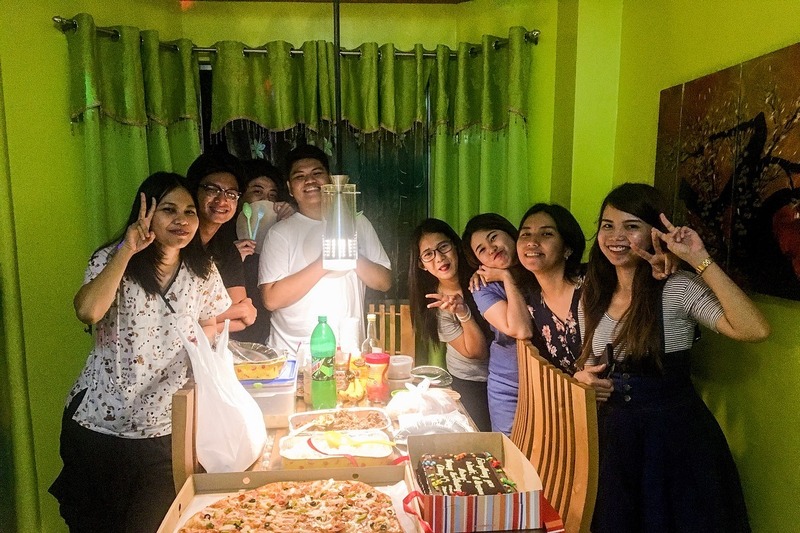 We celebrate clang's birthday and that's the perfect time to get together with #teamGA friends. 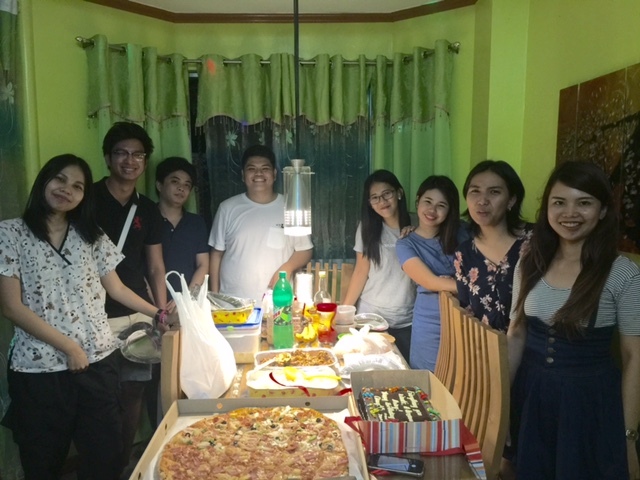 Insert Kuya Eyron, Loov, Toneng..
Moving on! They planning to go travel this coming October! Sana hindi lang sila advance mag-isip sa plano nila 😂😂😂 hopefully it will happen soon and I'm so excited to go travel with my friend buddies. I am glad that they planning to go travel and as you already noticed I love travel so much! hopefully crossfingers. It will be happen soonest!! I have learned that friendship isn't about who you've known the longest. It's about who came and never left your side. Your blessed if you have a true friendship. and as definition of friend is someone who you think your life would be different if they didn't exist. a friend is someone who NEVER leaves you out. Hahatid kapa ng cubao terminal yan pauwe ganern! 😂😂., you are always included when you are with them. A friend is there for you no matter what. You deserve friendship like this. After a grateful weekend. you need to take this kind of realty #ADULTHOOD Feels. Anyway How's your weekend? share your story! Good Friends are hard to find. Sounds like a long journey but in the end it looks like it was all worth it. I hope your October trip work out. It sounds like you had an awesome weekend, I have to admit we stayed in most of ours, I'm not good in hot weather and so I sat in front of the fan most of the time. It sounds like it was a great weekend! It is always fun to travel and spend time with good fiends! It looks like you've had an awesome weekend with your friends! I stayed in this weekend, I did plan to go to the beach but then I changed my mind and worked on finishing a post for a client. It really is nice to get time to spend with your loved ones and close friends. Time is precious and so there's no special time to do that. I need to do it more often. Sounds nice to be with loved ones. We had a great weekend here although it was so hot. We went to a nice air-conditioned movie. Ahhh. I'm glad you had such a fun weekend. It's always nice when you can get together with friends. Such a great lesson about friendship! so true as well! glad you had a great weekend! mine was very cool too! You are lucky to have good friends and they are lucky to have you. Like all other relationships friendship also needs nurturing and care and those who are willing to invest in it will have great friendships that last a lifetime. Lovely post! I had a great weekend as well, except mine wasn't nearly as eventful lol. This looks like it was so much fun! Thank you for sharing it with us! Even though you went all through that it's great your day ended by celebrating your dear friend's birthday. Real friendships are hard to find therefore treasure it with all your heart. i am very happy to hear that you had a blast with your friends. good friends are hard to come by, cherish every memory. Spending time with good friends is definitely needed every now and again. It allows you to take a load off from the hustle and bustle of life. Sounds like you had a great weekend. I just stayed home and worked and did laundry. Boring! It's incredibly hot where I lived. So we spent most of our weekend in the pool to cool off. It was a fun weekend nevertheless! Having s group of friends is really important! I’m glad you got to spend some good time with them. Its great to spend quality time with family and friends. Hello dear, I am happy you have friends you can actually call friends. Please don't take them for granted as they are priceless gems. Can we take a moment to talk about that pizza!!! Holy cow!!! Looks amazing! I love weekend gatherings with close friends. Looks like a great weekend witn some amazing friends. Happy 4th of July! Manila is a great place in general, minus the traffic and crimes. LOL! Enjoy it while it lasts. It is not everyday that you get to experience these things like you do in Northern part. And, when you all look back, you will only laugh at them. It's good that you get to travel and experience things with your friends. You won't stay young forever, enjoy while you can. Cheers! It's great to see you had a wonderful weekend with friends. It is always fun to travel and spend time with good fiends! True friendship is always worth it in the end! Great fun post. You are lucky to have such good friends. I loved your thoughts on friendship. Looks like a lot of fun, too! Very nice post regarding appreciating friendship. Thanks for sharing. Sounds like you had a lot of fun! My weekend was taking care of sick kiddos. Life as a mama. You and your friends look so happy together! you have so many lovely friends, thanks for sharing your experience. They seems your little treasures and you are so lucky to have them.